A very strong player. 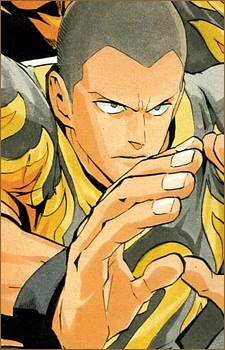 Not much is known about him, but in the previous year's match between the Ojo White Knights and Shinryuji Naga, both he and his brother (as first-year players) were sent out with 5 minutes to play and Ojo holding a 16-3 lead. Their entrance resulted in a 17-16 victory for Shinryūji. During their second-year Spring Tournament, the Nagas trounce the White Knights by a score of 40-3, without Agon playing at all. Unsui is passionately devoted to football, but is considered merely a "good" player. In contrast, Agon takes a casual, cynical, almost scornful approach to the sport, but is far better. Far more serious and intense than Agon, Unsui is much better liked, as opposed to feared like his brother is. He is a good player because of his wide range of vision, allowing him to know where all his players are. Rather than Agon's talent being innate, Unsui has worked all his life to become as good as he is. His workrate seemed to have been recognized when he received a sports scholarship at Shinryūji, but it turns out it was meant for Agon—the school got the twins' names mixed up. He feels his purpose is to back Agon up as much as he can, to make his god-given talents shine even more brightly.